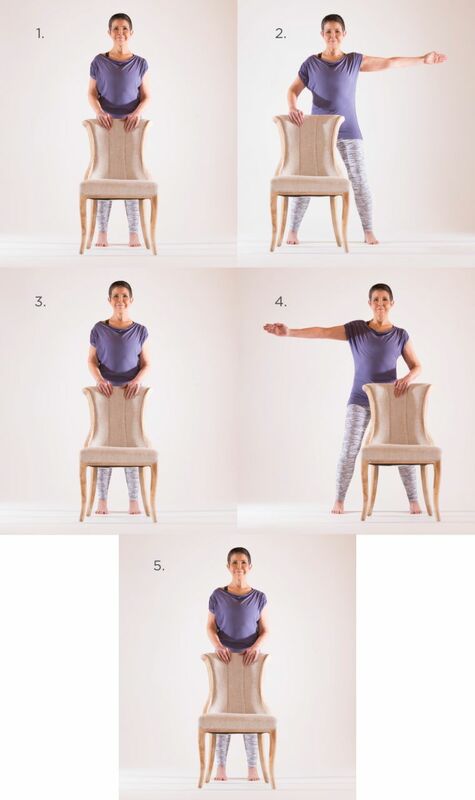 We suggest a chair practice because a primary concern for many of those with Parkinson’s disease (and other neurological problems) is falling, and because getting down to and up from the floor may also be difficult. However, if a person’s symptoms are mild or if they are working one-on-one with a yoga teacher or physical therapist who can safely spot them, a standing practice may certainly be appropriate. 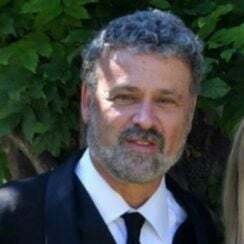 In fact, for those in the early stages of Parkinson’s disease, which we discuss more here, a practice like this one, for kyphosis, might be extremely valuable to reduce the forward curvature of the spine often associated with Parkinson’s disease. We also suggest the use of props and a mirror because they can offer additional cues about where the body is in space, information that may no longer be as readily apprehended by some people with neurological disorders, which may be accompanied by some degree of cognitive/perceptual problems. In addition to a chair, for the sequence below, you’ll need a strap, a bolster, and a block. If possible, practice facing a mirror so that you can ensure that you are in the alignment you intend—for instance, that your arms are as straight as you mean them to be. 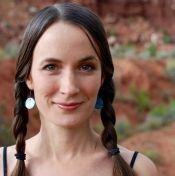 Music could also be a good addition to this yoga sequence because it has been shown to facilitate coordination and seems to have positive effects on the mood of those with neurological disorders. As for pace, though caution against falls in particular must be emphasized, those with Parkinson’s disease should aim to exercise as often and as vigorously as possible, since vigorous aerobic exercise—exercise that elevates heart rate for 20 to 30 minutes at a time—has been shown to be of particular benefit to those with Parkinson’s disease, improving motor and non-motor functions, as well as enhancing overall wellbeing. Vigorous exercise also seems to foster neuroplasticity, the ability of the brain to adapt and re-wire itself, both in those with and without Parkinson’s disease. Considering the above definition, what is vigorous for any individual will, of course, depend on their physical condition. Unless otherwise indicated, we suggest repeating these exercises several times, dependent on your current level of conditioning, even continuing until fatigue, at whatever point that occurs for you. Because postural problems may accompany some neurological disorders, practice establishing and holding a neutral spine. Root down through your sitting bones, and lift up through the crown of your head. Ideally your ears will be stacked over your shoulders, while the back of your neck remains long. 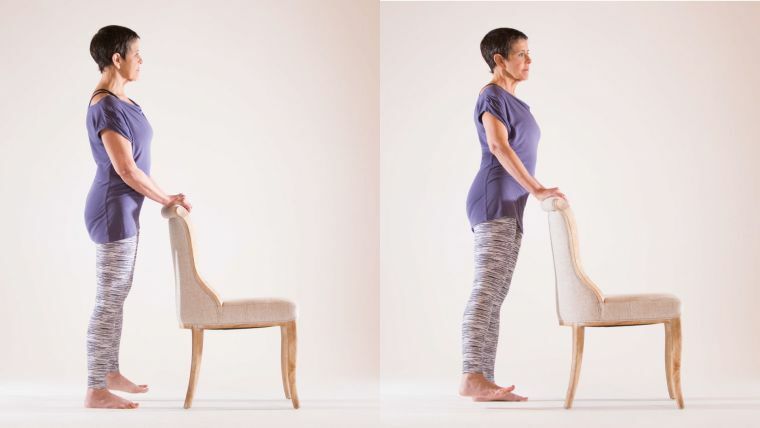 Broaden across your collarbones and lift the top of your sternum, placing your hands on your lap, or loop your fingers on the underside of the chair. Focusing on the sensations in the feet may foster a groundedness that helps with balance. Sit on the edge of your chair, with your feet hip-distance apart and parallel, and your hands resting in your lap or around the underside of the chair. Your eyes can be closed or open and relaxed. Imagine your feet surrendering their weight to the earth: your right foot, your left foot, the inner and outer corners of the balls of your feet, the inner and outer corners of your heels. Wiggle your toes, and try to lift and spread them. Then relax your toes down onto the floor. Diaphragmatic breathing can reduce the stress caused by vigorous physical activity, decreasing cortisol levels and increasing melatonin levels. Still seated on the edge of your chair with a long spine and grounded feet, place your hands on your belly. Take full, long, comfortable breaths, encouraging your belly to expand as you inhale and to draw in lightly as you exhale. Focus on your breath for a minute or two, establishing this diaphragmatic breathing and the awareness of that breathing that you will try to maintain throughout your practice. These movements are helpful for coordination. Though here the mudra is described with both hands, it can also be practiced one hand at a time to reduce the propensity in some of those with neurological disorders to perform involuntary movements on one side of the body only. If these movements become easy, you may speed them up, but never to the point that causes stress. 1. Bend your elbows alongside your rib cage, and position your hands as if you are holding a block in front of you: palms facing in, fingers outstretched. 2. Touch all your fingers of each hand to their respective thumbs, keeping a flat line from your forearms to the backs of your hands (a neutral wrist). Hold here for a breath or two. 3. Then, keeping only the index fingers touching the thumbs, lengthen your other fingers to make an okay sign, or jnana mudra. Hold for a breath or two. 4. Lengthen all your fingers out, as if you are again holding an invisible block. Hold for a breath or two. 5. Touch all your fingers to your thumbs again for a breath or two. Next, keeping only your middle fingers touching your thumbs, spread your other fingers. Keep going, until you get to your pinky fingers, then reverse the process, moving to your ring fingers, then your middle fingers, then your index fingers. Then outstretch all your fingers as if you are holding a block once again, and repeat the steps above several more times. This exercise strengthens the arms and shoulders, emphasizes exploring the full range of arm motion available to you, and uses a prop for extra feedback. 1. Rooting down with your feet and keeping your spine long, hold a block out in front of you just above your knees, stretching your arms straight. (Look in the mirror to make sure your arms are as straight as you intend them to be). 2. Squeeze the block, and slowly lift it up as high as you can, holding it overhead for a breath or two. 3. Lower the block down until it is just above your knees, take a pause for a breath or two, and then repeat several more times. Sways will gently challenge your balance. To make this exercise more advanced, hold the block out in front of you or overhead while swaying. 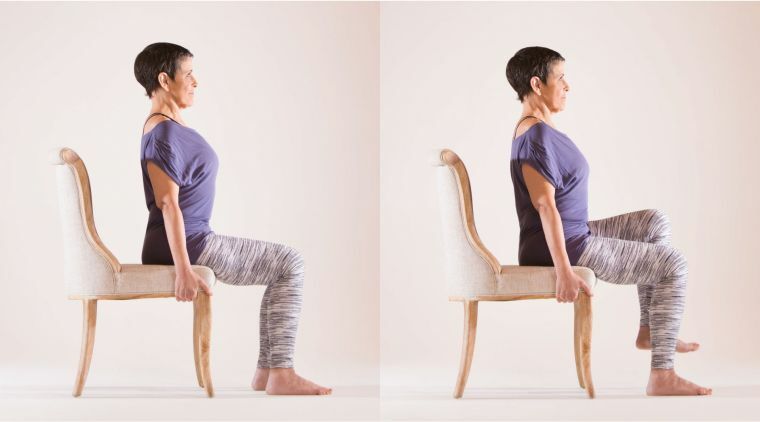 Seated on the edge of your chair, hands on your knees or thighs, keep a long spine and rock to the left as you inhale, lifting your right hip slightly off the chair. Rock to the right as you exhale, lifting your left hip slightly. Repeat this movement several times. Next, rock forward on your inhale, lifting your chest and extending your spine to come to a seated version of cow pose, then move your weight toward the back of your pelvis as you exhale, rounding your spine into a seated version of cat pose. Repeat several times. Then, slowly, over the course of a breath cycle or two, shift your weight from one sitting bone to the other and circle your torso and upper body in one direction. Repeat this circling movement several times. Make a circle in the other direction several times, then return to center when you're done. Parkinson’s disease is a risk factor for falls, and, for some people, everyday movements like getting up from or down into a chair can be both difficult and destabilizing. 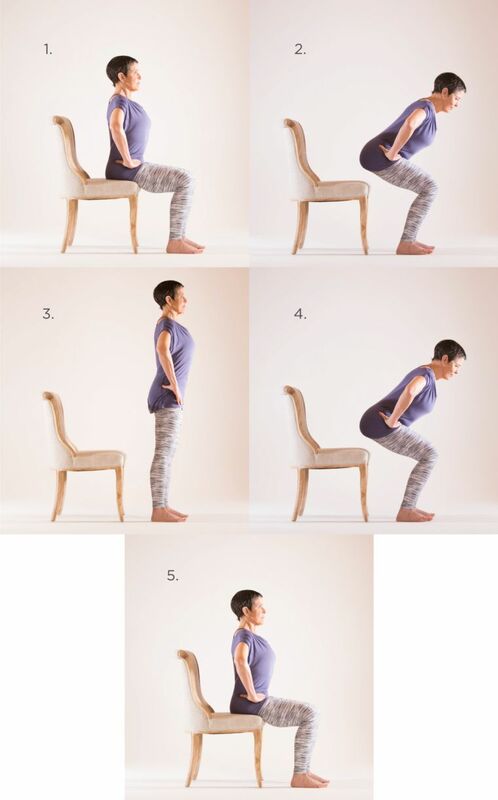 Practice moving from seated to standing, and from standing to seated, to build strength and stability that is directly applicable to daily life. To make this exercise more advanced, hold the block out in front of you or overhead. 1. Sit on the edge of your chair with a long, vertical spine, your feet parallel and hip-distance apart, and your knees over your toes, pointing toward the middle of your feet. Place your hands on your hips. 2. Keeping your spine as long as possible, tilt forward slightly to bring your center of gravity over your knees, and press into your feet to rise up to standing. 3. Take a breath while you get grounded, rooting down with your feet and lifting up through the crown of your head. 4. Slowly lower yourself back down to seated with control. Aim to keep your feet fully connected to the earth and to land as lightly on the chair as possible. 5. Take a breath or two, grounding through both sitting bones as you return to a vertical position. Repeat several more times. A tai chi practice shown to be helpful to the balance and gait of persons with Parkinson’s disease included “ankle sways,” which can easily be incorporated into a yoga practice. While below we suggest that you hold onto a chair, if your balance is trustworthy, you may certainly sway without the chair. Stand behind your chair with your hands on the back of the chair. Root down through your feet and lift up through the crown of your head for mountain pose. Slowly lean to the right as you inhale and then to the left as you exhale, repeating several times and exploring the limits of your stability. How far can you lean and still retain control of your balance? At first, simply shift your weight from foot to foot, side-bending slightly and keeping both feet grounded. But if this movement is going well, and you are able to maintain control of your balance, as you shift your weight to your right foot, try lifting your left foot, and vice versa. Next, slowly lean forward on your inhale, taking more weight into the balls of your feet. Then slowly lean back on your exhale, taking more weight into your heels. As you grow comfortable with this movement, lift your chest into a gentle backbend as you rock your weight toward the front of the feet, and round your spine slightly as you shift weight toward your heels. If this is going well, you can even lift your heels slightly as you bring weight toward the balls of your feet and lift your chest, and lift the balls of the feet as you shift weight back toward your heels and round the spine. Then, keeping your feet grounded, shift your weight and make several small circles to the right over the course of a breath or two. These circles might be miniscule at first, but allow the movement to gradually increase in size as your confidence in your balance increases. Then make several small circles to the left over the course of a breath or two. Return to mountain pose when you're done. These movements are large in amplitude to decrease rigidity and are asymmetrical to discourage the tendency to make involuntary “mirror” movements. To add more challenge, if you have your balance, bring one hand to your hip while you lengthen the other arm out to the side. 1. Stand with your feet hip-distance apart behind the chair, hands touching the back of the chair. 2. Keeping the right hand on the chair, step the left foot to the left, bending both knees slightly, and open the left arm wide into half of a T shape, with the palm facing forward. 4. Keep the left hand on the chair, and step the right foot to the right, opening the right arm wide. 5. Step back, bringing both hands to the chair. Repeat this exercise several times. Gentle backbends counter the tendency toward spinal flexion that accompanies some neurological disorders. If you are too tall or your chair too short for you to touch the back of the chair comfortably, simply bend your knees. Stand in mountain pose with your hands on the back of the chair. Root down through your feet, lift your chest, and broaden across your shoulders. Keeping the back of your neck comfortably long, look up toward the ceiling. Hold here for several breaths before returning to mountain pose. Boxing training has been shown to improve gait and balance in people with Parkinson’s disease. For this exercise, you may instead have a stable friend or teacher hold a bolster, which you can punch from a seated position, or a standing position if your balance allows. If this movement is easy for you, no need to take breaks between one-two punches. Place a chair against a wall, seat facing you, and position the bolster upright on the chair. Scoot your own chair close to the chair against the wall, but far enough from it that you have to straighten your arms fully in order to “punch” the bolster. Seated toward the front of your chair with an upright spine, bend your elbows alongside you, making fists with the thumb side of your hands up. Lean forward as much as you need to and give the bolster a one-two punch, turning your palms down as you jab it with your right then left hand. Return to a vertical spine and take a pause, relaxing arms and hands. Then give the bolster another one-two punch, jabbing it with your left then right hand. Repeat this exercise several times. This pose improves coordination and balance, combining criss-crossed limbs with movements in varying directions. Seated on the edge of your chair, perform eagle pose by crossing your right leg over your left leg and your right arm under your left arm. It is not necessary that the right ankle crosses behind the left (you can let your right foot dangle or you can use your right toes as a kickstand) or that the palms touch (your forearms could make a V shape instead). Lift your elbows high enough and reach them far enough forward that you feel a stretch between your shoulder blades, but keep the back of your neck long. Even though your legs are intertwined, imagine them trying to separate—the right leg wants to move to the right, the left leg to the left. Slowly sway from left to right with your breath, side bending slightly and inhaling as you move in one direction and exhaling as you move in the other direction. Repeat these side-to-side sways several times. Then, slowly sway forward and back, perhaps inhaling and lifting the chest as you tilt forward and exhaling and rounding the spine slightly as you move back. Repeat these back-and-forth sways several times. Next, shifting your weight from sitting bone to sitting bone, circle your torso and upper body clockwise a few times over the course of a breath or two, then slowly circle counterclockwise a few times. Then, keeping your legs and hips steady, twist to the right and stay there for a few breaths, then to the left. Repeat, twisting in each direction a few times. After taking a pause to uncross your arms and legs and relax, repeat this sequence with the left leg crossed over the right and the left arm under the right arm. A strong core can improve balance and stability. These marches strengthen the lower core—the lower rectus and transverse abdominal muscles. To make this march more challenging, you could bring your hands to your shoulders, your elbows wide, and even add a twist: As you lift your left leg, twist your upper body toward the left. As you lift your right leg, twist your upper body to the right. Sit on the edge of the chair, rooting down with both feet, grounding your sitting bones, and lengthening your spine. Grasp the underside of the chair with your hands. Keeping your right foot rooted and left knee bent, lift your left leg up a few inches, aiming to lighten the left sitting bone. Keep the leg lifted for a few breaths. Then reground the left foot. Take a pause. Next, keeping your left foot grounded, lift your right leg up, aiming to lighten the right sitting bone. Keep the leg lifted for a few breaths before lowering back down and taking a pause with both feet grounded. Repeat several times on each side. These partial sit-ups strengthen the upper core—the upper rectus and transverse abdominal muscles, which are also important for stability. For a more challenging variation, put your hands behind your head. 1. Sit on the edge of your chair, ground your feet, and lengthen your spine. 2. On your exhale, lean back by a few degrees, trying to keep your feet connected to the floor and your spine long. 3. On your inhale, come back to an upright seat. Repeat several times. Boat pose strengthens the core and the legs. 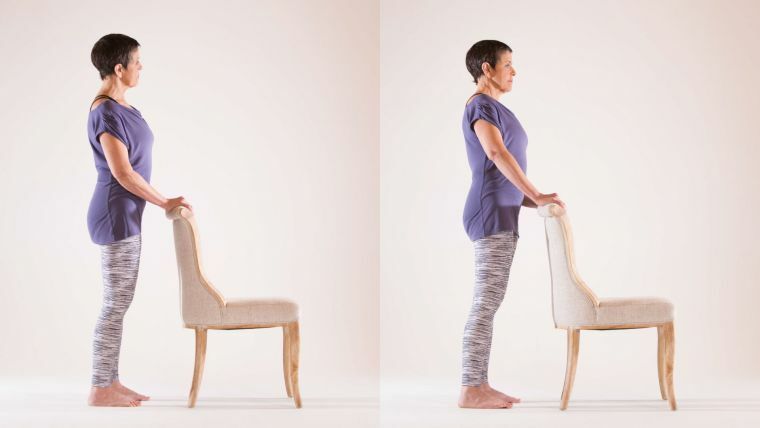 Sit on the edge of your chair and lengthen your spine, grasping the underside of your chair. Keeping your spine long, lean back and attempt to hover your feet off the floor. This might be enough. Hold here for several breaths. For more of a challenge, lengthen your legs out in front of you, straightening them as much as possible. If you have established your balance, reach your arms forward. Hold here for several breaths. Lower your arms if you lifted them, returning your hands to the underside of the chair, then bring your feet back down to the earth. Return your spine to upright, and take a pause before repeating boat pose several more times. This version of stretch of the west, paschimottanasana, stretches the hamstrings. You will need a strap. Sit on the edge of your chair, feet on the floor, strap in hand. Lasso your right foot with the strap, and straighten your right leg out in front of you as much as you comfortably can. Walk your hands down the strap and lean forward slightly if necessary in order to feel a stretch in the back of your right leg. Keep your spine as long as possible. Look in the mirror to make sure your leg is as straight as you think it is, and hold the stretch on this side for several breaths. Then take off the strap, replace the right foot on the floor, and then loop the left foot with the strap. Repeat this pose on the second side, holding there for several breaths. If you are able to get down to, and up from, the floor with ease, you could instead relax on the floor with your knees bent, feet and lower legs resting on the chair. Position the bolster you were punching earlier behind you vertically on your chair, the other chair close to you, with its seat facing you. Sit down in your chair, leaning against the bolster, and put your legs up on the other chair. Rest your hands on your thighs, or wherever is most comfortable for you. Relax here for five to ten minutes, closing your eyes and paying attention to the movements of your belly with each breath.